Imagine you could get your search traffic to hang on your every word. If every click from Google were to stick. People would glide down your page with ease. And, by the end of it, transform themselves into your loyal fans. Or, ever better – your repeat customers. How great would that be? You’re a few weeks away from throwing in the towel and giving up. The secrets of the best SEO copywriters are only a few scrolls away . Because in this article I’m going to show you exactly what you need to do to create SEO rich content that converts more highly than ever before. This is a super long article – it clocks in at around 9,000 words – so you’ll probably need to come back to it a few times (that’s what the bookmark button is for, right?). You might think getting people to see your content is hard. But, the real trick is getting people to read your content. And, without a good introduction, that’s never going to happen. Why? Because the introduction is what grabs a reader’s attention and makes the want to read the rest of the page. Let me put this in SEO terms for you. Imagine I’m looking to improve my overall Triathlon time. My intent here is to find out how I can improve my triathlon time. Go figure, right? But that’s something a lot of people forget. So when I land on a piece of content from the search results below, I want to know that you’re going to answer my question. The first page from Men’s Fitness, depsite being a big name in the industry, fails to do that. With that introduction I’d switch off and bounce to another page. Not ideal for the site owner. And, if I move down the page, I find an introduction that actually resonates with me. While it may be from a lesser brand, it’s told me it can answer my questions and hit an emotional chord with me. (I’m always looking at my old race times when I think about improving for my next race). But how do you write better introductions? Well, you don’t need hours of practice. Hack #1: Start With A Question? Do you know what’s amazing about human psychology? It’s that we always want to create the complete picture. And, questions are the perfect way to dig into that psychology. Why? You have the subconscious desire to find out what the answer is. I’ve been doing it since the start of this article – and this section – and you’re still here. Not only does it create interest in your article straight away, it also guides the reader down the page unknowingly – much like Bucket Brigades that we’ll talk about later. This is such a simple hack that so many bloggers and writers overlook. If you want an excellent example of this style of opening, head over to SmartBlogger. Jon Morrow and his writing team have this down to absolute perfection. You take an emotion, or a common belief, and press them about it. Passive Income does sound enticing. And, you want to read the next section to find out exactly what’s so enticing about it. Then he hits you with a bundle of emotions about the topic. Because he’s got you with the first question, he’s able to hit you with a big right hook of emotions. In the text box below I’ve included some copy and paste introduction questions that you can use to start your own articles. Just fit your words into the gaps provided. What if I told you that [subject] doesn’t need to be [power word] or [power word]? What if told you that baking doesn’t need to be messy or dirty? What if I told you that photography doesn’t need to be hard or expensive? What if I told you that meditation doesn’t need to be confusing or boring? Don’t know what a power word is? Keep reading this article to find out! How many times have you tried to [subject] but found yourself in [undesireable situation]? How many times have you tried going to the gym but found yourself bored and fat after two months? How many times have you tried forming a new habit but found yourself back to old ways in just days? How many times have you tried to learn German and found yourself not being able to get past Hallo? Have you ever wished that you could [desired action] without having to [undesired action]? Have you ever wished that you could get a new phone without paying hundreds of dollars in monthly fees? Have you ever wished that you could eat carbs without having to worry about piling on the pounds? Have you ever wised that you could pick up girls without have to learn how to become a pick up artists? Do you [improved situation] when you [take action]? Do you smell better when you wear cologne? Do you get less injuries when you use a foam roller? Do you save energy when you use LED light bulbs? All you have to do now is give them an emotional spike that makes them want to read the rest of your article because they know they’re in the right place. This is an introduction method used by Brian Dean in his Copywriting Case Studies. And, it’s so effective I couldn’t not include it. Agree: Recognise the reader’s problem, acknowledge it and agree with it. Promise: Make a promise about fixing their problem. Preview: Give them a taste of what you’re going to show them in the article. This is one of the most useful frameworks you can use if you’re stuck for ideas. Because all you have to do is fill in the blanks and you have an instantly good introduction. Let’s take a look at it in action, shall we? Here’s a sample blog post from Stencil. I’ve chosen this because I wanted to show you the method in action without Brian being the one to have written it. The first step the author takes is to agree with the reader. Take the problem and go, “You know what, I agree, doing that is seriously not enjoyable”. It’s simple, but it’s perfect. That first set of sentences instantly shows a reader they’re at the right article for their search query. You’ve matched their search intent. The next step is to make a promise and give a preview. Now, there are two ways you can approach this. You can either roll them into one, or you can make them separate. Although it is tweaked slightly, it follow the same premise. They tell you the problem that they’re going to fix, and tell you what they’re going to show you in the article. It’s quick, simple and effective. Doing [subject] is really [bad emotion or situation]. Well it turns out that [achieving desired situation] may not be as [emotion] as you’d have thought. All you have do is [solution]. In this article I’m going to show you exactly how I [achieved goal/got result]. Travel Hacking is really hard to wrap your head around. Well it turns out that getting all the points that you need to fly for free may not be as hard (or as confusing) as you may have thought. All you have to do is follow a simple system. In this article I’m going to show you how I used this Travel Hacking system to fly return from New York to Sao Paulo for free, with a night’s free hotel stay thrown in too. You probably have no idea how to get started either. Anyone can start making money online as a freelance writer, including you! That was officially my favourite subheading to ever write. And, it’s because it’s one of my personal favourite strategies. With this method you utilise something call The Bridge Model. It’s an old NLP method I picked up when I worked in corporate companies back in the UK. And, now it works brilliantly to get people to read your articles. The Desired Situation: Let them picture where they want to be. The Current Situation: Bring them back down to earth. Offer A Bridge: Create a bridge between the two situations, and position your article as the solution. Quite often you’ll find copywriters use just one step of this process. Maybe two, when they preview their article. But when you put all three together you really feel the benefit of it. I even used it in the introduction of this article to drag you down the page. Here it is in action, with the first step I build the big picture of what you want from SEO copywriting. In the second step, I reiterate where you are now. That makes you feel the pain and discomfort of where you are right now. Leaving your reader poised and ready to devour the next few hundreds (or thousand) words that you’re about to give them. Want to use this for yourself? Here’s a cheat sheet to help you use it in your own articles. Image you could [desired situation]. How good would your life be? If you could [paint a picture of their ideal world. What they strive for and what they wish they had]. But, right now, here you are. Without any of that. [Paint picture of their current situation]. What went wrong? There is a way you can start [subject]. And, it’s not too hard to do for yourself. All of the answers you need are right here in this article. To get them, you just need to read on. “Imagine you could make all of your money through your blog. How good would it be? You could lift up the lid of your laptop, write a few blog posts, connect with your readers – then sit back, relax and watch the money roll in. It’s the dream, right? But right now, here you are. Sat in front of your laptop, reading this article, wishing that was your life. You’ve tried all of the courses. You’ve listened to all of the webinars. And, you’ve poured your heart and soul into finding your passion. And while it feels like everybody esle can make a living from blogging – you’re struggling to put food in your belly. There is a way you can start monetising your blog. And you’ve been sitting on top of at all along. It doesn’t cost you any money, and you’ll find all the answers for free right here in this article. If you’re a Brian Dean fan, you’ve probably heard him talk about Bucket Brigades. Drag someone down the page. And, because you are a completion-ist, you can’t help but read the next sentence, can you? Nope. See. I did it again. They are proven to reduce bounce rate and increase your on page time. Not only that but when people bounce back to the search results from your site, that is a strong negative ranking factor that you want to avoid. But they also aren’t just limited to colons and ellipses. There are lots of phrases you can use to assist people down the page that will increase your on-page time (and if you do it right, your conversions, too). All entice your reader to carry on down the page. This works for Sales Copy and Blog Posts. Heck, if you combine them with Brian Dean’s Bucket Brigades from before, you’ll get have no chance of losing people on your page. For example, if you’ve ever listened to Gary Vaynerchuck speak, you’ll notice he says one phrase more than anything else…”Let me explain.”. And as soon as you hear it, it makes you want to listen to the next point he’s about to make. And with his latest project, he’s consistently able to get low bounce rates and high on page times on his articles. You can simply go through your content and sprinkle them after you’ve written it. Or, use data to figure out exactly where they need to go. If you find people are dropping off after 15%, 20%, 45% and 65% of your content you can strategically place them there to get people to jump to the next stage and carry on further down the page. Want to know which parts of your content your audience cares most about? Well, in content links help you find that out. If you’ve ever read one of my long blog posts, you’ll notice that they all come with a contents list. By having these on my post not only does it make it really easy for your to navigate and for me to create a better user experience. I’m also able to use a heat map – like the ones that come with SumoMe – to track where you’re clicking. And that gives me valuable insight into the types of content that I should be creating. … I’d know that there is a market for me writing products about those topics. You may think this is obvious for a blog like mine. But, let me show you an insight. It was from this type of list that I came up with the idea for this post about how people can make money at home from surveys. And I can use the links in all of the articles I’ve created in this format to see what content people are interested in, too. How do you set this up? Well, it just takes a little knowledge of HTML. You can find out everything you need to create links within your content by following this tutorial right here. Once you have links set up you’re able to track them using tools like the Free Heat Map tool you get with SumoMe. All you have to do is hook it up to track the post. Then, hey presto, you have insight-driven content ideas and a much better User Experience that Google will love. Win, win win! A few years back I picked up a copy of a Copywriting Book from a local book shop. It was one of those second-hand ones with thumbed pages and someone else’s notes pencilled into the margin. Always tease your reader about what’s about to come. In traditional copywriting – what it was originally intended for – this was about getting people further and further through a page or an advert. In today’s SEO copywriting the rule still stands, because you want people to read as much as they can. This increase on-page time, social sharing and interactions on your page. All of which influence rankings. What this does is it keeps your reader, well…reading. Even if they bounce from the section on your page, they’ll be more likely to skip ahead to that section of your content. This is a wonderfully simple way to increase the time spent on your page and bring people even further down your content. I’ve even employed the trick in this article. (You may be picking up on me doing that throughout the article). You can even combine this with the last point and link ahead to the points that you’re making in your article, too. You can track the clicks and drop hints. Incorporating this into your article is easy, too. If you’re writing you can drop it in when you find a point that’s related. Or when you’re editing you can go through and drop them in. Long Tail Keywords are great for search engine traffic. But the problem with them is that they don’t always sound natural. What people type isn’t exactly the same as what they speak. You’d never walk into a shop and say, “Fix iPhone 7 phone speaker”, because you’re not four years old. But that’s what people search. So, how can you as an SEO Copywriter make them sound more natural and blend seamlessly into your content? After all, a page optimized for an exact match keyword will still rank more highly than one that isn’t (or for a variation of). Well the answer is simple, and you’re going to smack yourself when you hear it. Ready? While an exact match Keyword is ideal you just can’t make Fix iPhone 7 Phone Speaker sound natural. But, Google is smart enough to rank your page as highly with just a few extra words. So, don’t be afraid to add extra words where needed. My only real advice would be to not dilute your keyword so it’s not recognisable. Instead just add one or two words to make it sound more human. It is honestly that simple. If you can make your keywords blend in without editing them, then please do it, but if they stick out like a sore thumb all of the time, then you need to employ this strategy. Did your parents ever tell you to ‘save the best until last’ when you were younger? Well, it may be great advice for getting you to eat your Brussel Sprouts; but it’s awful copywriting advice. When you go to University, or you learn to write in School, you’re taught that good writing – like a novel – builds up to an amazing finish. It’s all about the ending. Well, the truth about Copywriting is that you most people aren’t there for the ending. In fact, only about 30% of your readers will be there. So it’s in your best interest to put the most important content at the top. You know, what’s going to make the biggest impact. And, while all of your advice is valuable (you lovable little brain box you), you also have to be prepared to kill your darlings. Starting at the top with the least important information and building to a crescendo of amazing information at the end of the article. But by the time your at the middle import info, almost all of your readers are gone. This way – much like when you read a newspaper article – your audience can gather the information they need and drop off the page filled with the information that they need. Now, this may sound a little against the grain. But, you’ll be surprised. For example 6 out of 10 people will share your article without reading the full thing. So by giving them the information sooner, rather than later, you’re almost optimised for sharing. In terms of conversions, you can even front-load your buy in’s and lead magnets, so people can take action at these parts of your articled too. They’re getting the highest perceived value of your content, and they’ll be inclined to convert more early on. This is a really small change you can make to your content that will have a big result. Over the last few months I’ve been toying with using blog posts with no sidebars to capture email addresses. Both of them have an over 90% chance of outperforming the original style post. My bounce rates went down, on page time went up and I’ve converted more subscribers overall. I’ll be converting all of my posts to the wide format in the very near future. This is a simple SEO copywriting tip but it can evidently make a big difference to your results. After looking at this, you’ll probably realise you’re losing hundreds of visitors for no reason. Subheadings are an often overlooked part of your content. But, after your headline and your introduction, they’re the next most important element. Why? Because 79% of your readers are scanners; they don’t read everything that’s been written. A sub-heading sells your readers on that section of the content. Let me demonstrate. This subheading sold me on this part of the article and I was engrossed in it, reading every word. I may only have read 30-40% of the article in total, but the subheadings helped me get the answers I needed. This doesn’t just work in the practical how-to articles, either. If you write, this rule applies. But how do you write good subheadings for your articles? Well let me show you. There are 3 different types of high-performing subheadings, and they work for different articles in different ways. I’ve highlighted the article type you should be using them for. The Storyteller approach is simple. Starting with your article headline you begin to tell a ‘story’ as your article carries on. It’s not the most exciting style in the world. But, for search, it works. You’re able to capture scanners and pull them in at the points in the content that they want to read. Just be sure to follow the story of the promise that your headline makes. SmartBlogger are excellent Subheading writers. And I’ve stolen some of their tactics for my own use in the past. Creating this mixture of emotions might sound hard, but if you follow these next few points, you’ll do it easily. Don’t just attach labels: A label just tells you what the next section is, for example, “Important Coffee Ingredients”. Adding intrigue here can capture more scanners, for example, “The Coffee Ingredients That Improve Your Focus” would be more benefit driven and interesting. Don’t be cryptic: In trying to create curiosity it’s common to mask the point altogether. For example, if you’re writing an article about baking, creating a subhead that says “Don’t Whisk Away Your Dreams!” doesn’t make much sense out of context. The key with their style of headline is to make a point and draw the reader in, without letting the reader walk away from your article full of knowledge from just the headlines. The final type of SubHeading that I recommend is the Benefit Driven style. That means your headline should display the benefit of reading the next step in the article. This is quite easy to do. Instead of looking at what your next section is about, think about what it allows the person to do after they’ve read it. Let’s say you’re writing an article about How To Write An eBook. Which of these two subheadings would be more appealing? Because if I’m writing a book I want to make money from it. If having the right cover design helps, then I’m in. When trying to choose a benefit I find it asks the question, “Which allows them to do what?”. It’s simple, easy and effective for getting people to dive into the next section of your article. As Hobo Web point out here, Google was built to read bad HTML. It can read any code, as long as it’s used in the correct way. After all, not every site will be perfect, and not everyone is a web designer. I’m still a firm believer that having clean code, with as few mistakes as possible, has an impact on rankings. With all of my clients sites, and my own sites, I like to make sure everything is correct (much the dismay of Guest Bloggers sometimes). And when you’re writing blog posts – especially if you use Microsoft Word or Google Docs – and putting them into WordPress, you can find yourself with a lot of crappy code that makes your site harder to crawl. Take this blog post excerpt that’s been created in Google Docs. It looks all fine and pretty here, right? Well, let’s take that and copy it into the WordPress Visual Editor as most bloggers and copywriters would do. Again, it looks all find and okay from a user point of view. But if I go ahead and click the Text tab at the top of the page, you’ll see that it unlocks an absolute HTML nightmare behind it. And you’ll find that there are unneeded spaces around Bold and Italic words that just don’t need to be there. Ideally, you want your code to look clean and easy to read on the back end. No spaces, unusual tags or pointless other code that doesn’t serve a purpose. Google is trying to find the answer to a query as quickly as possibly and you need to make that as easy as possible. Then, once it’s all clear, copy it back into the text section of WordPress and it’ll go onto the site without the extra code. You can even go back and do this through all of your existing blog posts and improve your crawl-ability in a heartbeat. Have you ever wondered why most corporate blogs are so freaking boring? Well, it has a lot to do with the type of words they use. Not only are they boring, they’re actually really hard to read. The long terms, business speak and buzzwords all make them difficult to interpret. But, why is that? Well, most people who come to your site don’t read English to a high level. That goes for most of the world’s population. Six out of ten countries on that list of countries will have learned English as a second language. Meaning their English probably won’t be at a native reading level. They may even be using translation tools to help them understand. And it’s not just that way in the USA, either, the UK has a similar problem with 16-24 years olds. So if you’re writing at above this level, you’re going to be creating content that people just can’t read (at least not enjoyably). That means you’ve wasted a lot of time writing content for no gain at all. Let’s go through an example together. Take a look at these two quotes about language learning. Which of these two quotes is easiest to read? “When you embark upon learning a new language it can often be difficult to differentiate between the different tones, nuances and inflections in people’s voices. This is because they all originate in different areas, with their own dialects. To become proficient at this you need to invest lots of time and dedicate specific blocks of time throughout your week to be able to become attuned to this plethora of vocal ranges. “When you first learn a language, listening can be really hard! People’s voices sound really different, and it’s rare two are the same. This is because each region has it’s own type of language called a dialect, and this can change how words are being said. By taking some time to practice throughout the week, you can start to understand all of these different tones of voice. It’s quote B, right? Because it uses simpler words and it sounds like someone talking to you. Nobody speaks like that first comment. You’re engaged, connected and don’t need to stop to look up any of the words in a dictionary. But, how do you measure what level your text is at, and what should you be aiming for? Well, that’s pretty simple. The bottom paragraph, the readability stats, are what you care about here. More importantly the Flesch-Kincaid Grade Level. Now, I won’t bore you with what all of that is. Instead I’ll tell you this – the number used is the grade of school that can read your text. You want to aim to get this between a 7 .0 and 8.0 for most of your blog posts. If you can get it down to a 5.0 or a 6.0 even better. But, it’s hard if your niche does have some specific industry terms. The best way to do this is to go through your content multiple times and figure out if you can explain it in a more simple way. Or, if it’s how you’d actually speak. Take out the big, unimportant, words and make it as easy to access as possible. Brian Dean sent out an email a little while ago that talked through exactly how he managed to boost his organic traffic by 45.5% in just 7 days. In it, he talks about adding emotion to your Page Titles Tags. If you’re not sure what a title tag is, it’s the headline people see in Google for your article (which can look separate to your actual headline). Adding emotion isn’t hard, either. According to Brain all you need to do is add one positive or negative emotion into your Title Tag. Either will work and they’ll improve your CTR. For example, let’s say I wanted to create a headline about different types of Fashionable Hats for Men. That’s an okay headline, and it gets straight to the point. But, how do you make it emotional? The simplest way is to add a power word (more on those later) at the beginning of the headline. Already you can see that’s added a new feel to the headline. It’s eye-catching, hits them with an emotion straight away. But are there any other ways you can do it? Too right there are! One I like to experiment with is sprinkling a power word into the headline at different points. This makes the headline much more appealing, interesting and emotional. (Why will these hats ruin my new outfit?). But how do you set up your Title Tags? The simplest way is to use the free Yoast SEO tool. It tacks onto the end of your blog posts and you can edit everything there. You’re able to see how it’s going to look in Google, too. Meaning you can get the job done right the first time! For every post I publish on this blog, I always write 3 different titles and split test them. Once a winner is found, the plugin will automatically default to the most effective title. It’s a great free plugin that everyone should be using! And they’re an often overlooked part of your article. Because, well…if you’re not an SEO you don’t really have much experience with them. But they can have a big impact on your overall SEO. Google is quite open about the fact that they don’t use Meta Descriptions as a ranking factor. However that’s not what you should be worried about here. Instead, as Kissmetrics advise, you should focus on how they grow your click through rate, which is a potential ranking factor. This Meta Description provides a window into your content. It helps people decided before they look at your page if they want to read your content. Descriptive: Talk about what your article is about. Persuasive: Convince the reader they should choose your article. Inspire Curiosity: Make the reader inquisitive about the content on the other side. Match The Searchers Intent: Show that this article is what they’re looking for. 156 Characters Or Less:Make it Tweet-sized and you’re onto a winner. Now that sounds like a lot of work to do for just 156 characters of copy. But, don’t fret. It’s not as hard as you might think. Let me show you some examples of great Meta Descriptions. It’s short and sweet but ticks all of these boxes. If I’m looking for a guide on how to set up a VPN, I’d feel in safe hands here. It only takes a few words to create a truly good Meta Description. While you may be willing to overlook this section, part of the reason why good meta descriptions are so effective is because there are so many wasted ones. So make the most of the opportunity. You can make all of these changes easily using the Yoast SEO Plugin. Instead of just giving you some generic descriptions you can’t use, I’ve built these to fit the three most common post types. And, they can updated to fit any style of post you may write, too. Want to know how to [keyword]? Then you need this guide! Inside you’ll find [X] simple techniques to help you [subject] without [undesired situation]. Want to know how to make sushi? Then you need this guide! Inside you’ll find 15 simple techniques to help you make sushi without the mess. Want to know how to see Berlin in 24 hours? Then you need this guide! Inside you’ll find 10 must see tourist attractions to help you see Berlin without getting lost. Want to know how to lose fat? Then you need this guide! Inside you’ll find 10 simple fat loss techniques to help you burn the fat without giving up your life. [Subject] getting you down? Then you’re in the right place. This list of [X] [things] about [keyword] will make you [positive emotion]. Writing meta descriptions getting you down? Then you’re in the right place. This list of 10 perfect meta description examples will make you over the moon! Learning Spanish getting you down? Well, you’re in the right place. This list of 20 spanish language hacks will have you convering in no time. Finding books to read getting you down? Then you’re in the right place! This lisot of 8 successful business books will solve all your problems! Looking for a [business type] [location]? Then look no further. We’re specialists in [subject] and we want to help you [get desired result]. Looking for a Plumber in London? Then look no further. We’re specialists in Plumbing and Heating and we want to help you for the best price. Looking for Thai food in San Franciso? Then look no further. Here at Try Thai we make Thai Street food with a twist, to fill you up and spice up your pallet! Looking for Furniture Removals in Sydney? Here at Puolos Removals we try and make your move as easy as possible! Click here to find out more. When you write there are two elements to it. What you wrote and what you meant. By describing yourself more accurately you not only create more engaging content – thus improving on-page time and the amount of your content that is read – you also make your content more scannable. Reading on the internet takes up to 25% longer than on paper, so people are more likely to scan through your content. Using bold and italics will catch their eye as they skim and mean that the sentences that they are picking out help your overall. Whenever you type something, read it back to yourself, and look for where you should be stressing a point. Let me give you an example. I’ll use the sentence, “I don’t think Digital Marketing is boring”. “I don’t think Digital Marketing is boring” – this implies that you don’t think Digital Marketing is boring, but someone does. “I don’t think Digital Marketing is boring” – this implies that you don’t think Digital Marketing is boring, you know. “I don’t think Digital Marketing is boring” – this implies that you don’t think Digital Marketing is boring, but you think something else is. “I don’t think Digital Marketing is boring” – this implies that you don’t think it’s boring, it’s something else. By changing these stresses, as you would in speech, you can really improve the quality of your writing. And, as a byproduct, the number of people you’ll reach. Your font is the body language of your content. While your words say one thing, your font says something different. For example, if someone was to send you their resume and it was written in Comic Sans, you’d assume a small child had written it. But if you get it in Times New Roman or Calibri, it feels a lot more professional. Now, not only can your font set the tone for your content, it can also impact how long people read for. There are two types of fonts you need to know about. Serif fonts and Sans Serif. Serif fonts are the fonts that have a little flick at the end of each letter, like handwriting and Sans Serif fonts don’t have that. That little flick can be the difference between someone staying on your content for longer, or dropping off early. As Andy Maslen points out in his book Write To Sell, it shuffles people down the page and makes them read for longer. As the Crew blog found, these fonts can also impact how people feel about your content. Like how the fonts on Medium have a calming, but authoriative, feeling to them. Now this isn’t essential for you. After all, you’ll notice that I don’t use a Serif font on this blog. But what I have found is that if you don’t use a Serif font it’s important to use a BIGGER font. Big fonts are easier to read. More accessible. And, while they may not be too aesthetically pleasing, they convert much higher. As I also found in my test of other page layouts. Go big or go serif; it’s your choice. Power Words have insane potential for your SEO copywriting. They’re the most, well…powerful words you can use. But what is a power word? It’s a word that creates and emotion in someone. When it’s read, it evokes a feeling in someone that compels them to think, feel or take an action. They’re also words that stick in your mind. You can use them in your headlines, your text, you calls to action and everywhere between to create a response in someone. Now there are hundreds of power words you can use, so I’m going to refer you to this guide that contains all of them, and seperates them by letter. Or, if you want to know which words create an emotion, you can check out this SEO copywriting guide from SumoMe. 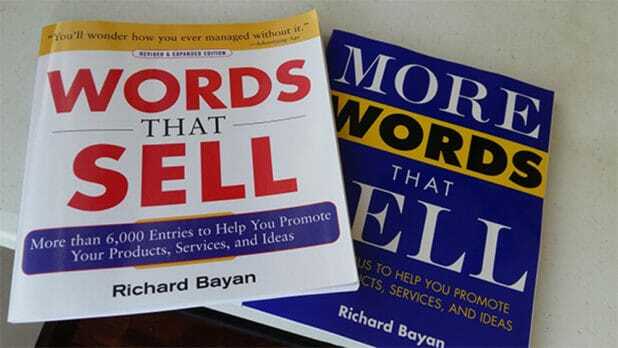 These are great books to have lying around on your desk for quick reference when writing any type of copy and are jam packed with power words. There are also a bunch of extra copy writing tips, structures and more for quick reference and perfect for anyone that wants to improve their SEO copywriting skills. The active voice is a way of writing (or speaking) that has a lot more clarity. It uses fewer words and reads a lot better. Now I don’t want to give you a grammar lecture here. Instead, I want to show you first what it is. And then what it means for SEO. So, what is the active voice? According to the brain’s over at Duke University it’s a shorter, personal and more direct approach to writing. Basically, it’s writing how you’d speak. Okay, before your eyes glaze over, hear me out. At school you’re taught to write in the passive voice and that is bad for SEO. Mainly because it’s really hard to read, and doesn’t create a good user experience. The SEO was done by Matt. The Guitar is plays by James. The pizza was eaten by Michael. See the difference? It makes sentences longer and it’s really damn boring to read. People will switch off and your on page time will plummet. Take a look at these two examples and tell me which one is easier to read. The SEO is done differently by our technical team. We aim to find the best and most highly ranking keywords and use them strategically so that your site can be ranked well by Google and help you generate from new clients. We do SEO differently here. We find the highest ranking keywords and strategically place them on your site so that you can rank higher and generate new income from new clients. The second one, right? Not only is it shorter, it’s like someone is talking to you. It has a snap, crackle and pop. Which is exactly what you’re looking for. Simple and effective. This is a super important SEO copywriting tip. So, make note! Grammarly has made a huge difference to my SEO copywriting over time. It’s common, when you’re writing an article of this length, to get so used to what you’ve written, you miss your own mistakes. No matter how many times you read it over. The Grammarly tool is a much better way to make sure you catch all of your grammatical mistakes and rectify them with just a few clicks of a button. Honestly, I only recommend tools that I use day in and day out. This is one of the most effective content creation tools that you can’t afford to ignore it. Even if you just grab the free version. One of the first tips I ever give to a new copywriter is to make the most of internal linking. If you’re not sure what it is, internal linking is where you link from one page on your site to another. For example, if I mention Snapchat in an article, I can link to one of my articles about Snapchat. Not only does this increase the time people spend on your site, it also allows you to spread the power you get from Backlinks to your site around to different areas of your site. Increasing your overall presence in the eyes of google. It also makes your site quite easy to crawl, because there are many ports of call where the ‘spiders’ can find their way to different parts of your site. When you don’thave backlinks, creating a site structure like this is of real importance to you. Although it hasn’t been updated for a while, it is definitely the best plugin for the job! Phew! That was a long article. But hopefully you’ve walked away armed with lots more SEO copywriting tips that will get you the results you’re looking for. Introductions are key: If you don’t get your introduction right, you’re wasting valuable traffic. For a simple solution, open with a question. After that, start trying to add emotion. Article structure: Don’t save the best until last. Hit your audience with key information, first. Title Tags and Meta Descriptions: Make sure your presence in the SERPs is felt by using emotion and custom descriptions. Create in content links: So you can find out exactly what your audience is looking for and cater to it. Write for a middle-school reading level: So your work is as accessible as possible. Using the active voice makes this a lot easier. Remove all of your bad code: Because why let bad HTML stand in your way? Okay, now I’m interested to know what are your favourite SEO copywriting tips? How long u write this? You mean how long did it take to write? Another great article for 2017, keep ahead with your strategy brother. In page title use “Men’s Fitness” its legal? Because i think that trick isn’t good. That was a great article, Matt. You had me hooked all the way through which is unusual as I have the attention span of a Goldfish most of the time. Some really great tips in this one. Hahaha thanks Gary, I hope you implement them and see improved success! There should be a “get” right after instantly. Otherwise, a great post, enjoyed reading it. Another superb article Matthew, thank you. I’m going to jump over to the income report as I tend to act after receiving an email from you but this is perhaps not how most of your readers find you. I did try to find the post about buying your theme which I remembered that you had posted about – it took a few tries to get to the link I wanted. I’m not sure that the benefits are explained well there. I really enjoyed the reference points, especially around readability. Thank you again Matthew, lots learned. Matthew this is another KILLER post and is full of juicy bits of info. I am glad you mentioned writing for a middle school reading level. Its one of the hardest things to explain to a client who doesn’t understand how important it is for SEO and the user experience. Also, I love Grammerly and got the paid version and use it whenever I write a blog post. I’m glad you mentioned it. I’m definitely referring back to this and I’m going through my blog posts to see if I can spruce them up with your tips! Oh, and I couldn’t get your social share links to work to gain access to the cheetsheet. It just showed the loading animation and never let me share. I’m using Chrome on a Windows 10 PC. Ok after trying again, it worked. Thanks for the cheatsheet! copywriting has been a weak point for me from a long time but this article really covers everything which is needed to be done. Yeah you can do 99% of what you need to with this! Ohh, this is unreall cool! I will use this methods on my Bali dedicated site. Hope it brings you improved success! OMG, This took me THREE HOURS to go through and understand completely. That is WAY TOO MUCH INFO in just one post. It’s demoralizing to try to learn all this at once and WHO HAS THAT KIND OF TIME without it gashing away at time with FAMILY??! I suggest making these content-thick-and-rich posts into a series and just email them to us so we don’t end up EXPIRING before we manage to hack our way through them….seriously…who gains from me being on this page for THREE HOURS?!! Or stay on the page for 3 hours and then scream at Matt for creating a dragon-slaying blog post that could explode your blog traffic. Great guide. Copywriting is an art and one can be master only if he writes more and more content. However, if someone who never ever tried if before they should read this guide to take the suggestion. Every tips which you have mentioned are amazing especially AAP method of Brian Dean. I loved reading this post from top to end. Can you suggest a good word processor ? You can’t get much cleaner than notepad! That’s an amazing guide Matt. I would like to add to the “Create Tantalising Subheadings” point. One of the major traits of successful bloggers is..
As you can see I not only got the reader to the next line using Bucket Bridge but also made the smooth transition to the point I wanted to make. That is an awesome extra tip thanks Mohammad! Matthew, wow. :) Thanks for investing time into writing this. Hook after hook after hook. You’re a beast! I rarely read anything above the fold. This is powerful juju you’re sharing. Have a blessed day. I’m rereading this. Thanks for your kind words Ozzie! I have read almost all the articles you send to my mailbox but not with the attention I have read this one. I have actually read twice so far. It just clicks with me somewhere. You can have a fine-looking website design and use the latest technologies to make your visitors say “wow!” but unless your web page copy is compelling enough, and unless it gets the right traffic to your website, the only business you do will be accumulating the “wows!”. Proper SEO copywriting ensure that your content is search engine friendly and relevant/helpful to your target audience. Excellent post, thanks so much for your informative, in-depth and extremely helpful post. I really learned a lot and am sure that once I implement what I have learned here, I will be better off. Great post Mathew! You had me hooked through the entire post. Will definitely apply these great tips to my blog. Bravo! Great article! I tried to share this on Pinterest but using your Pin It button doesn’t make a pretty link. Let me know if you tweak your Pinterest image for this so I can share it. For now it’s bookmarked. great article but i personally find it difficult to read such long articles. Very tiring. I’ll be coming back to digest the rest, there is a lot of super useful info stuffed into it, my brain needs more time to process it all. Thank you for your hard work. Thank you for the great post, fantastic read. For those that have no option to outsource content (due to a massive site and massive content schedule) what would be your tips or tricks on hiring the right people for this? Where do you hire writers? Not only because you typically write epic, well researched posts -but you also strive to improve your writing quality. Not every SEO expert goes to that extreme. Glad to know you’re also a fan of Jon Morrow’s writing. Do you find people also jump to the conclusion soon after beginning your blog? Your multiple suggestions for ways to begin a blog are awesome, as well as providing visual examples of each. As you mentioned, Brian Dean is also strong at both SEO expertise and blog writing. You’re both role models! Any tips for cleaning up http code using the WordPress Thrive theme? Despite converting word to html it’s still a nightmare to input and cleanup content? Great article, Matthew! If I only take one thing away, it will be the APP technique. Very powerful! Thanks. I always preferred to use my own stories in the content. Men’s health’s website is using the attractive headlines which attract more readers. The example you have given above can really help. I got a few ideas for my next blog post. Thanks for sharing the guide with us. No problem Ravi, I hope it helps you to grow! Mind blowing article !! Need to implement this ASAP. I read some of your articles before, but this time I will be investing more time into this one. I need to know how to present my ideas. So thank you Matthew for all your hard work and tips. Wow! This is awesome. Very long post but I had to read through to the end. Writing powerful titles is something every blogger should give attention to. Yeah it makes a huge difference! Thanks Matthew, what a valuable resource it is… I really enjoyed and must give a big THUMBS UP! I will surely try to follow your tips…. Thank again… Btw, I have done a case study on Unique C-Class IP addresses for PBN and my results were amazing.. I hope you would like to see it…. Let me know if you are interested so I can share it with you — and it’s not a spam comment! I think this is the best article I have ever read about copy writing. As you have mentioned above, Grammarly helps to find out some major but unseen errors. Another great post, I have been trying to implement all the techniques in my own blog. Let us know how you get on with the changes! What an article! This is awesome. I will be investing more time into this one. I need to know how to present my ideas. You know, this is one of the longest article I read and then read again.. Great post! Which techniques did you use in your video? I use the The Bridge Model for my video. Well you are writing great English here so keep up the good work Irvan! I thought your title tag was a pretty important part of your SEO ranking. It really doesn’t do any harm to split test these? I wasn’t aware it could be done ‘in real time’ like that and not affect anything. The split testing plugin is awesome! Already started using it on one of my sites. Thanks for the tip! Worked my way through this article step by step and it changed my writing straight away :) Thanks so much for putting all your content out there. Always straight to the point. Love it! Some nice advice in this post. Content creation is one area where I think all SEO’s could stand to improve, especially with the link and ego bait opportunities that come with great content (and outreach). Of course, and copywriting will help with that! Great guide for SEO Matthew. Thanks for sharing! This post is freaking epic. Any chance I can get it in a pdf? Excellent, detailed as always. Thanks. I usually just scan for the good stuff. But i could not stop reading this one. The techniques are proven in the article, how often does that happen. Can’t wait to use these, I’m writing a new post now. Great work! Usually I don’t like to read content more than 1000 words but I am reading one and each sentence from 1 Hour and writing key points in my Notepad. Thanks a ton for this post. Hahahaha glad you stuck with it! ITS another great article … well presented and great points.. This is another great post, I learnt a lot from this. Well here’s a post I’ll be sharing with a few folks I know. Cheers for taking the time! Nicely put together. Great the community has people like you. I’m gonna share this one with a few close friends, thanks! No problem Roberto, glad you liked it! It’s been quite some time that I bookmarked this post. The question is what I’ve been using every time. I came back for varieties and that one about emotions will be added to the arsenal. Thanks Kay, glad our finding the article useful!